For someone who did not ask for much outside help, doing everything from singing and playing instruments all the way to fully producing the album himself, Paul Kloschinsky has constructed a shockingly respectable release. Like Your Hero is the second full album from this Vancouver native. Kloschinsky is a musician, first and foremost. But he is also a poet; and you can bet that plays into his lyrics. In 2007 he won the MusicAid Award for Best Canadian Songwriter for “Wearin’ Blue,” a track on his first release. A listen to any of his songs will tell you why he was awarded with such an honor; his songwriting and storytelling skills are such that it makes his words difficult to forget. “Ignition” and “Like Your Hero,” the first two tracks on the album, were released as singles soon after the complete album was put out. And it was done so with good reason; these are two of the best tracks on the entire album. “Ignition” showcases Kloschinsky as a complete package. It offers a catchy beat with memorable lyrics, shows off his writing skills, and even contains an electric guitar solo. “Like Your Hero” is likewise catchy. In that the album shares the same title it is fitting that the album artwork be based off this track. He creates a fairytale feeling in both the artwork and the lyrics by depicting a knight slaying a beast in order to save his love. In that these two songs are the first two heard it makes the album feel a bit frontloaded, though there are still other noteworthy tracks. Kloschinsky’s songwriting style and vocals are similar to that of Bob Dylan’s. The vocals are scratchy and not perfect in the least, but those imperfections work to give his music a heavier folk aspect. The tracks are all centered around acoustic guitar, though stringed instruments offer an additional backing, giving the tracks a richer, more layered appeal. “Fields of Green” is a great example. There is so much going on instrumentally, but not so much that it takes on a bogged down sound; it is just enough to make the track pop. “And Be Near You,” on the other hand, leans toward the opposite side. It is a fast-paced song with swift instrumentation. The acoustic guitar on top of electric guitar on top of strings on top of drums is a touch too much. More often than not the instruments unfortunately tend to blend together, making it difficult to perceive the full effect of each one. The final track, “The Bargain,” comes as a lengthy end to the album. The harmonica, an instrument not heard very often through the album thus far, plays a major role within this track. The song is about a deal that was made between the devil and himself. The track ends with no conclusion, though. Instead, he is still waiting for the devil to come back for him and steal his soul. The fact that there is such a detailed story within the lyrics makes up for the song being a full nine and a half minutes long. In that it is so long you would assume there would be some sort of instrumental intermission, but there are only verses and choruses to be found here. There are points within the album where the rhythm of the vocals do not quite match up with the beat of the song, which serves as a fairly distracting aspect. Everything else, on the other hand, is enjoyable. 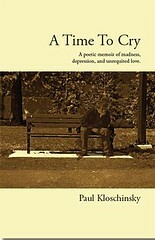 There is true talent in Kloschinsky’s work. Like Your Hero is worth a listen for the lyrics and melodies alone. I found this website very awesome and I just wanna say thanks. I hope you keep up the good work!